There’s a spring-fed dam down the bottom of one of our paddocks which used to have plenty of water, and a few bulrushes. After what I’ve dubbed the “eight month summer” from October 2012 to May 2013 (i.e. 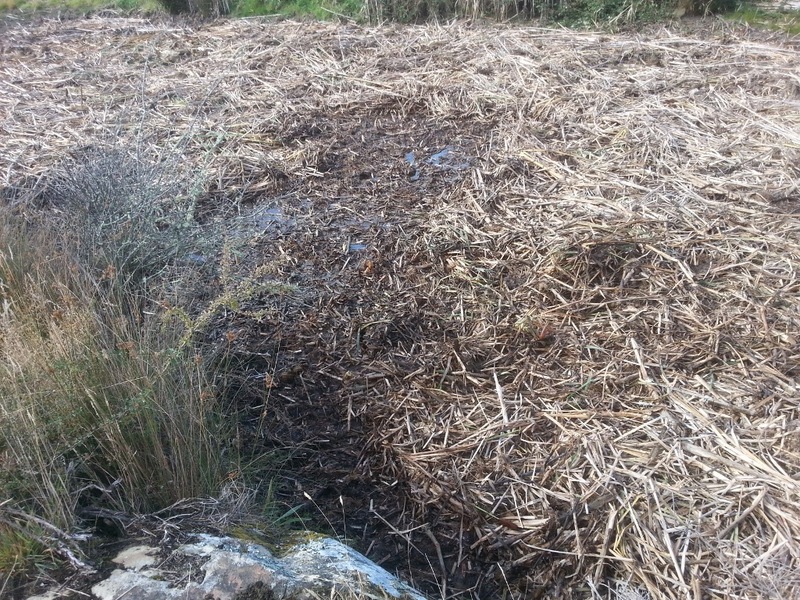 eight months of below average rainfall), most of the water in the dam was gone, and there were rather more bulrushes. Flash forward to the end of last summer (approximately February 2015), and we had all the bulrushes and no bloody water. It’s basically clear now; there’s a smattering of bulrushes attempting to regrow, but I have high hopes that it should at least be manageable now if we keep on top of it. It sounds pretty impressive to say this was a forty-nine day project, but it was actually “only” about twenty-five hours work. On the other hand, if I’d attempted to do the whole twenty-five hours back to back, I’d probably be dead now. Possibly we should investigate basket weaving. This entry was posted in Uncategorized and tagged Projects by Tim Serong. Bookmark the permalink. I remembered that Barney told me about how the Maoris used to make bread form the pollen of the bulrushes, which they call Raupo. There is a full description of the process here and the recipe, which is on a different page on that site, is as follows. Shake as much yellow pollen from the raupo heads as is required, and to every half a kilo of pollen use half cup of cold water to mix. Put into a greased bowl, and steam about 2 hours. The Maoris used to wrap raupo leaves round the mixture and steam in the hangi. Of course now we don’t have any bulrushes to try this recipe with. However I am confident they will return and we shall give it a go. Nice post. Love the photos. I so understand why you started to make paths to avoid monotony. That’s an interesting looking frog. Do you know what species it is? I’ve tried looking on this website: http://www.parks.tas.gov.au/indeX.aspX?base=3060, which is a great Tassie frog resource, but I don’t think I can find your frog. Amazing Tim, that’s really impressive! Shows what persistence and a strong back can produce. 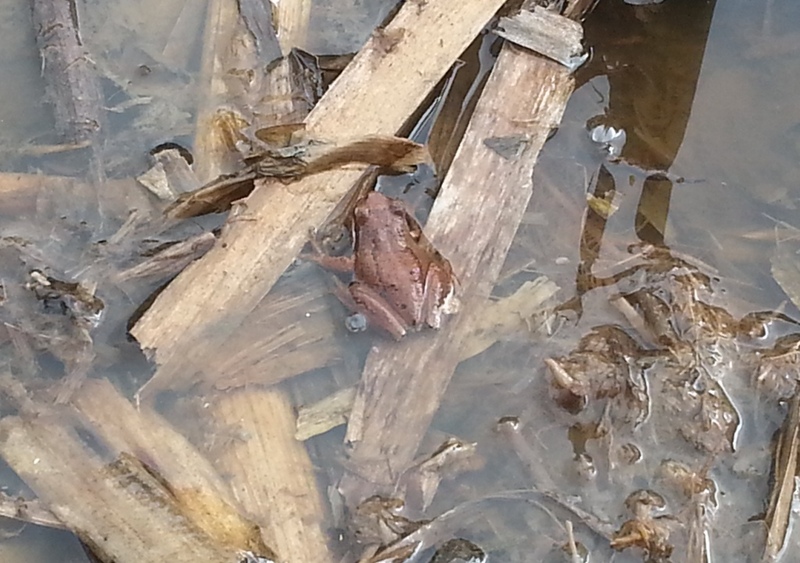 It will be interesting to see if the water gradually returns – love the little frog. Nice post. 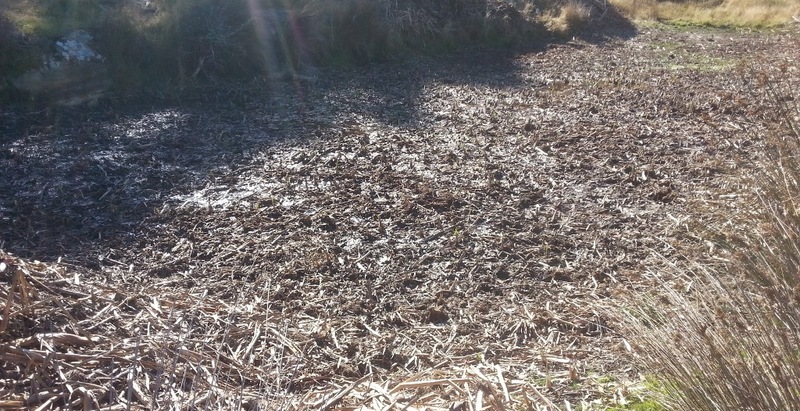 We are also interested in the subject of leaky dams in Southern Tassie. In fact I’m interested in best practice dam management for hippies. I’d be interested to see any early basket weaving results Please do post an update. It remains to be seen whether or not it’s actually leaking. There’s some good information on repairing leaky dams in Bill Mollison’s Permaculture: A Designers Manual . In my opinion the most interesting approach suggested is gley, which is “a layer of mashed, wet, green, sappy plant material sealed off from air”. Apparently you make a 15-23cm layer of this stuff over the base and sides of the dam, then cover completely with earth, cardboard, paper, plastic sheet, something, and it ferments anerobically to produce a bacterial slime which permanently seals soil/sand/gravel. Once the ferment is done, you fill the dam by pump or hose and remove the lining. Note: I have not tried this myself. 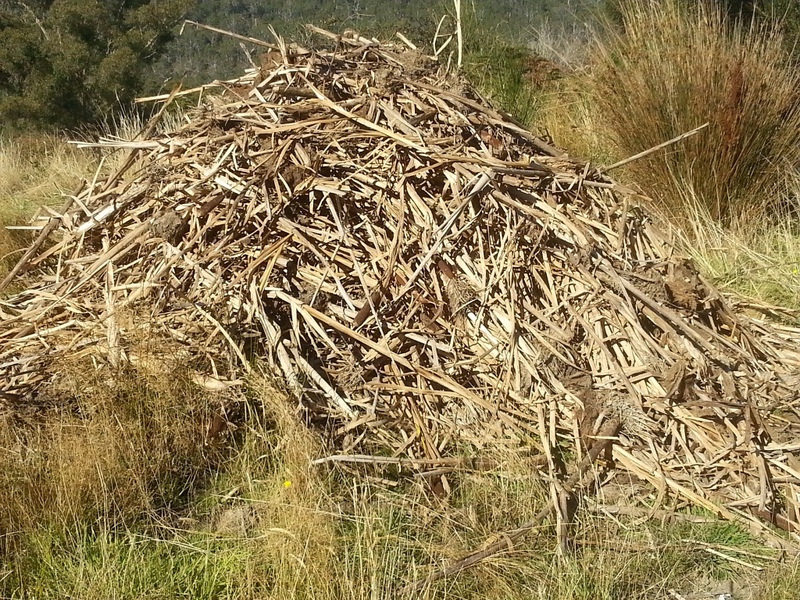 Have you thought about a weeding wand and glyphosate?